When it comes to recording liens against California real estate, we follow the ‘first in time, first in right’ rule. (Civil § 2897) If your lien, or deed of trust, is recorded before mine, then yours is superior. If you foreclose, and I do not pay you off, my deed of trust is wiped out, and I am left with an unsecured debt. However, there are exceptions, one of them being equitable subordination, which applies where equity and fairness require a different result. Equitable subordination is a concept used to correct equitable wrongs in the strict priority of liens on real property. If fairness requires, a first lien can be subordinated, or reduced below, a second lien, swapping their positions. (Civ. Code, §§ 2876, 2903, 2904.) A recent decision saved a $3.2 million dollar mortgage from being subordinate because the title company did not pick up the prior recorded deed. In JP Morgan Chase v. Banc of America Practice Solutions, the Siems applied to JP Morgan to refinance the 1st & 2nd loans against their Newport Beach house, for a loan of $3.2 million. Meanwhile Mr. Siems medical corporation got a $2 million dollar loan from Banc of America, primarily secured by the property of his medical practice. However, the Siems also personally guaranteed the business loan, and Banc recorded a deed of trust against the same house. Banc knew about the original 1st & 2nd, and expected its loan to be in third position. c) JP’s loan closed two months later, without updating the preliminary report; the title insurance policy did not show the Banc loan. e) JP entered the lawsuit, seeking an equitable lien. The court first looked at JP’s conduct. It expected to pay off the two loans, and be in first position. It obtained a preliminary title report & title insurance, on which it relied. While JP had constructive notice (the Banc lien was recorded) it did not have actual notice. Constructive notice does not prohibit equitable subordination. Thus, JP was not found to have shown inexcusable neglect. Next, the court looked at Banc’s equities; if they were equal to or greater than JP’s, then JP would not be entitled to the subordination. Banc knew about the 1st and 2nd, and expected that its deed of trust would be in the third position behind them. In this case, the equities favored JP. 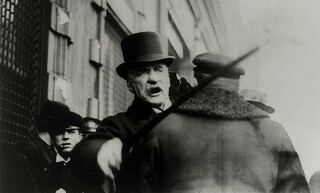 JP Morgan appears upset in this photo, is that an errant title officer? JP’s lawsuit was probably prosecuted by it’s title insurance company. An experienced California and Sacramento real estate attorney would advise him to make a claim on his title insurance. When there is a delay between the prelim and closing, title insurers routinely order an updated prelim. 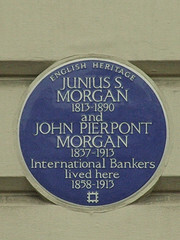 Here that did not happen, and the title company insured JP that there were only the first and second deeds of trust which JP was refinancing. That was a costly mistake.